Son of Hunger-Striking Palestinian Leader Marwan Barghouti: I Haven’t Touched My Father in 15 Years | Democracy Now! son of Palestinian political leader and hunger strike organizer Marwan Barghouti. He recently launched the “salt water challenge,” asking supporters to express their solidarity with the hunger strikers by posting videos online drinking salt water. "Why We Are on Hunger Strike in Israel’s Prisons"
It has been almost a month since over 1,500 Palestinian prisoners have been on hunger strike inside Israeli jails. The strike, which began on April 17, was called by Marwan Barghouti to protest poor living conditions in prison and the administrative detention law, which allows Palestinians to be held without charge. Barghouti is the most high-profile Palestinian in Israeli detention. 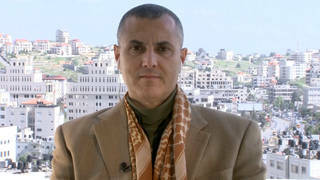 Some have described him as the “Palestinian Nelson Mandela.” In a New York Times op-ed announcing the strike last month, Barghouti wrote, “Having spent the last 15 years in an Israeli prison, I have been both a witness to and a victim of Israel’s illegal system of mass arbitrary arrests and ill-treatment of Palestinian prisoners. After exhausting all other options, I decided there was no choice but to resist these abuses by going on a hunger strike.” We speak to his son Arab Barghouthi. He recently launched the “salt water challenge,” asking supporters to express their solidarity with the hunger strikers by posting videos online drinking salt water. AMY GOODMAN: I’m here in San Francisco, will be speaking in Santa Cruz and in Palo Alto, and then we’re on to San Diego and Los Angeles. Well, to talk more about the hunger strike and Marwan Barghouti, who has been described [by] many as the “Palestinian Nelson Mandela,” we’re joined now by his son. Arab Barghouthi recently launched the “salt water challenge,” asking supporters to express their solidarity with the hunger strikers by posting videos online drinking salt water. Welcome to Democracy Now!, Arab Barghouthi. Why drink salt water? ARAB BARGHOUTHI: Well, thank you, first of all, for having me. Salt and water is the only thing that these prisoners are living on. They haven’t taken anything other than the salt and water. And it’s a symbolic act. And we just wanted to be creative, outside of the box, to raise the awareness and let everyone know what is going on. It’s been going well, and it went viral in the Arab world. And here, it’s growing more and more. AMY GOODMAN: Arab, tell us about your father, Marwan Barghouti. ARAB BARGHOUTHI: Well, my father is a political leader that has been struggling and fighting for his freedom and his people’s freedom for more than four decades. He spent more than 21 years of his life in Israeli jails, was kicked out of Palestine for seven years. He was elected twice as a member of the Palestinian Parliament. And he is a member of the Central Committee of Fatah, which is the highest committee of Fatah party. My father is very well supported nationally and internationally. He’s supported by icons like Nelson Mandela himself, who met with my mother and showed his support to my father’s campaign, international campaign for his release. The former U.S. President Jimmy Carter happens to be one of the biggest supporters of my father and sent us a video asking for the release of Marwan Barghouti personally. My father is nominated for the Nobel Peace Prize by seven nominations, seven times. Two of the Nobel Prize laureates just did the salt water challenge and happen to be one of the main supporters of my father. AMY GOODMAN: So talk about why your father, Marwan Barghouti, started this hunger strike. AMY GOODMAN: Arab, when did you last see your father? How often can you and your brother and sister see your dad, as well as your mother? ARAB BARGHOUTHI: I was 11 years old when he was arrested. I used to see him twice a month until I turned 16. After 16, I would see him maybe once every two years. I haven’t seen my father in two years. ARAB BARGHOUTHI: They just don’t give me permission to go. And this happens also to my 1-year-older brother. My oldest brother, Qassam, has seen him only three times. And Qassam himself was imprisoned for three-and-a-half years for basically no reason, for being guilty of being the son of Marwan Barghouti. My mother would see him once a month, but sometimes they just don’t give her permission for three and four months. AMY GOODMAN: Earlier this month, the Israel Prison Service released footage of Marwan Barghouti purportedly eating in his cell. Barghouti’s supporters have said the video was fabricated in an attempt to discredit the hunger strike. Barghouti’s wife, Fadwa Barghouti, spoke out against the footage and warned that Israel intends to defeat the hunger strike by all means. FADWA BARGHOUTI: [translated] The level the occupation has reached, in my opinion, is a deterioration. Instead of focusing on this video, the world should blame and punish Israel for this ethical deterioration, where they are fabricating a film. We were not surprised, because during my last visit to him, I heard from him that they will launch a serious battle against this strike, using all tools and methods to defeat it. AMY GOODMAN: So, can you comment on this, Arab? Today is your mom’s birthday? AMY GOODMAN: Where is she? ARAB BARGHOUTHI: She’s in Ramallah. She’s the one who holded my father’s message and took it everywhere, and she’s the reason why he’s recognized internationally. And hopefully, next year, I will celebrate her birthday with my father. Regarding the video, let me tell you that I’m his son, and I can’t tell it’s him in the video. That’s first. Even if it’s him, my father spent more than three years in the solitary confinement, so it would—it can be taken anytime. But on the other side, this shows you the amount of desperation the Israeli government got to, to put such a cheap and low-quality video. And here, I just want to say that they like posted the video. They put him in the solitary confinement to punish him for the op-ed New York Times article. They did torture him. And the only thing that they didn’t do is just to meet demands. This shows you, yeah. AMY GOODMAN: I have 15 seconds. The conditions in the prison? ARAB BARGHOUTHI: It’s really bad. And we have sick prisoners. We have the administrative detention, which is holding prisoners for years without even visiting the trial court, with not visiting the families. I haven’t touched my father in 15 years. This tells you all what the hunger strike is all about. AMY GOODMAN: Arab Barghouthi, I want to thank you so much for being with us, the son of the Palestinian political leader now on hunger strike, Marwan Barghouti. He’s been in prison for more than 15 years. Arab has recently launched the “salt water challenge,” asking supporters to express their solidarity with the hunger strikers by posting videos online drinking salt water. That does it for our show. I’ll be speaking in Palo Alto, in Santa Cruz, in San Diego and Los Angeles. Check our website.